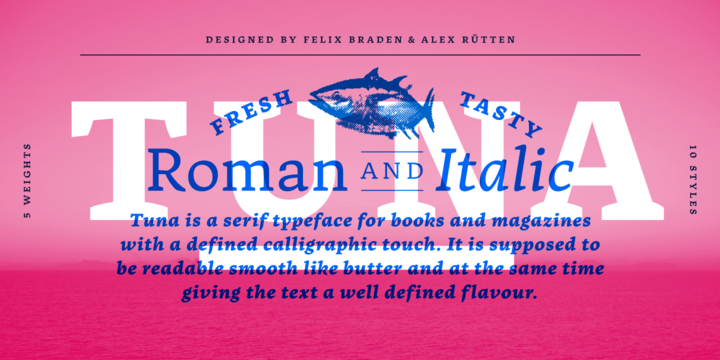 Tuna is a contemporary typeface created by Felix Braden together with Alex Rütten and published by Ligature Inc which is available in 5 weights and their italics. It is characterized by low contrast, strong angle, dynamic structure derived from broad nib pen-writing, large x-height, moderate extenders, horizontal emphasis, heavy, slightly arched serif, open aperture and large counters. It is ideal for editorial use, optimized for on screen reading. With more than 700 glyphs, it supports all Western, Eastern & Central-European languages. Cannot miss it! Price: starting from $49,00 for one font to $249,00 for all 10 fonts. A font description published on Tuesday, January 31st, 2017 in Alex Rutten, Felix Braden, Fonts, Ligature Inc by Alexandra that has 2,842 views.